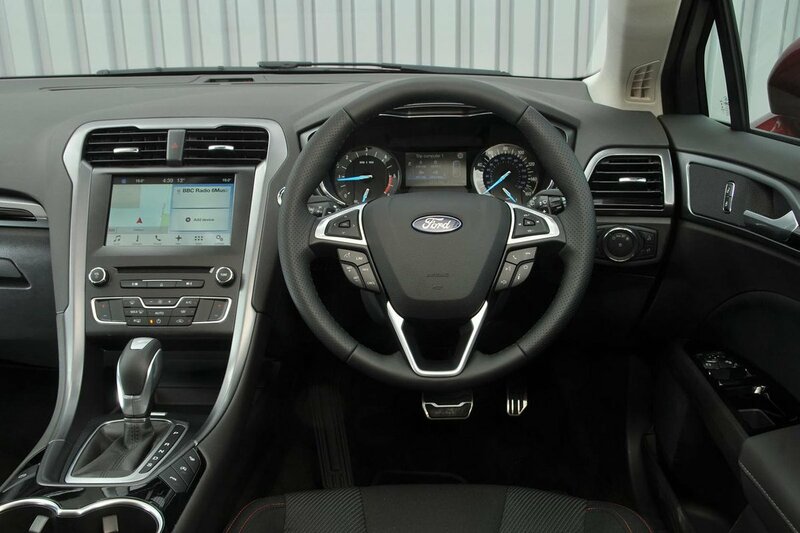 Ford Mondeo Interior, Sat Nav, Dashboard | What Car? Go for entry-level Zetec Edition or ST-Line trim and you'll have to manually adjust the driver's seat, but the posher trims come with 10-way electrically adjustable front seats as standard. 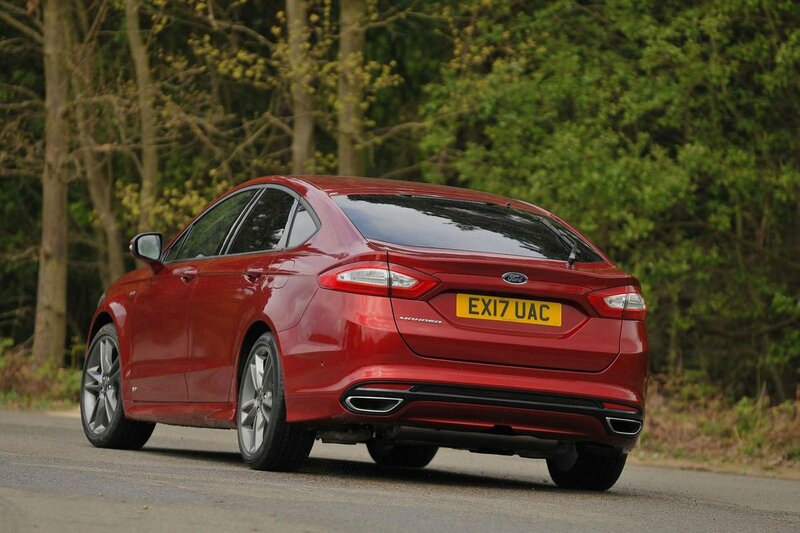 Either way, the Mondeo's seats are comfortable over long distances and reasonably supportive. ST-Line models come with sports seats to hold you in place a little more securely through corners. Overall, there's little to complain about, although the Mondeo's air conditioning controls could be a bit more user-friendly; to adjust the interior temperature, you have to stab away at buttons rather than simply twisting a dial like you do in most rivals, including the Skoda Superb. This isn’t a Mondeo strong point. The raked-back chunky front pillars can partially obscure your view at junctions, while the sloping roofline and wide rear pillars cause big blindspots over your shoulder. Also, because it’s such a big car with fairly swoopy lines, it can be hard to judge the Mondeo’s extremities in tight parking spots. Having said that, many rivals suffer from similarly mediocre visibility, including the Mazda 6, although the Superb is substantially better. All trims do at least come with front and rear parking sensors as standard to help mitigate this, while a reversing camera is a reasonably priced option. You can also add blindspot monitoring on any trim level, although it's a cheaper option on the posher trims. A heated windscreen is standard on all trims and means you can clear the screen of ice and condensation much faster than by using the air-con system alone. 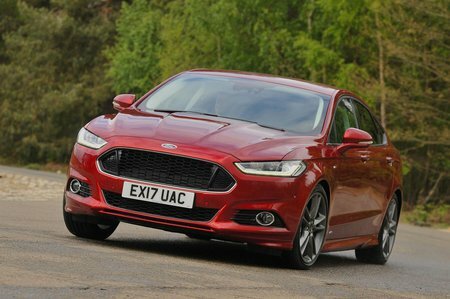 When it comes to infotainment gadgetry, the Mondeo stacks up pretty well. That's because even entry-level Zetec Edition trim gets you an 8.0in colour touchscreen with sat-nav, a DAB radio and Apple CarPlay and Android Auto smartphone mirroring. Range-topping Vignale models have a punchier 12-speaker Sony sound system. This system can be added to some of the cheaper trims but the difference isn't huge, so we'd save the money. Most executive cars in this price bracket have a touchscreen (unlike the more intuitive rotary dial-controlled systems in, say, the Audi A4 and BMW 3 Series). However, the Mondeo's isn't particularly user-friendly compared with the touchscreens in some rivals, including the Superb. The graphics aren't especially sharp, either. Again, not a Mondeo strong point. In fact, compared with most exectutive rivals, even in this price bracket, the Mondeo's interior feels rather low-rent. There's lots of hard, matt grey plastic on the centre of the dashboard, for example, and the buttons on the steering wheel also feel quite cheap. Interior quality was improved during a facelift in 2017, but the Mondeo still lags well behind the Superb or Volkswagen Passat, let alone premium-badged executive rivals such as the A4.